Kori Bustard (Ardeotis kori) one of the largest living bird in the world today. It's also one of the largest flying birds that still exist. It is the member of the bustard family that consists of four species throughout the world - ranging from Africa, India, and Australia. 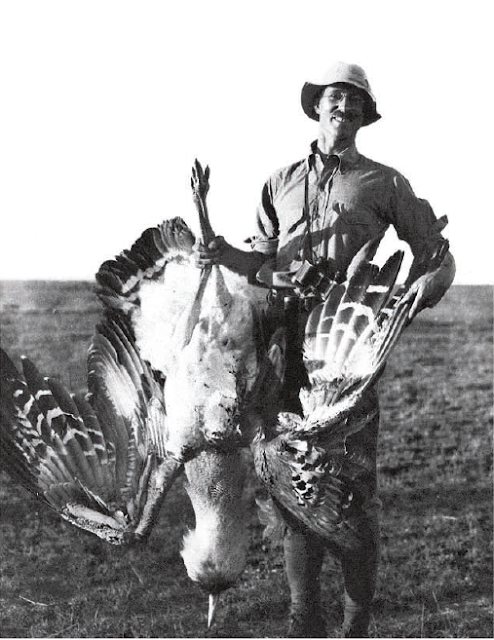 Being the largest flying bird, kori bustard flies a short distance and only when needed. It will spend most of its time on the ground forage occasionally in low bushes and trees. Kori bustard is omnivorous birds and will eat almost anything from insects, small reptiles and small mammals, and also seeds and fruits. 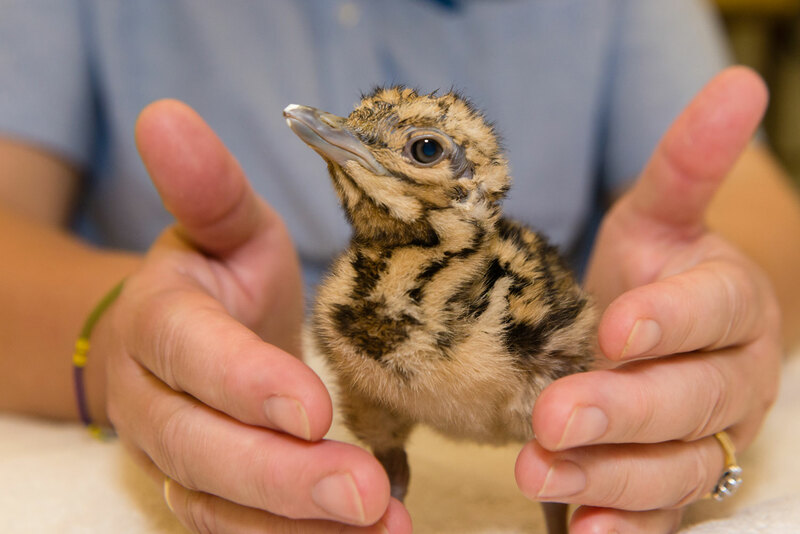 Being heavy, kori bustard will try to avoid flying unless necessary. 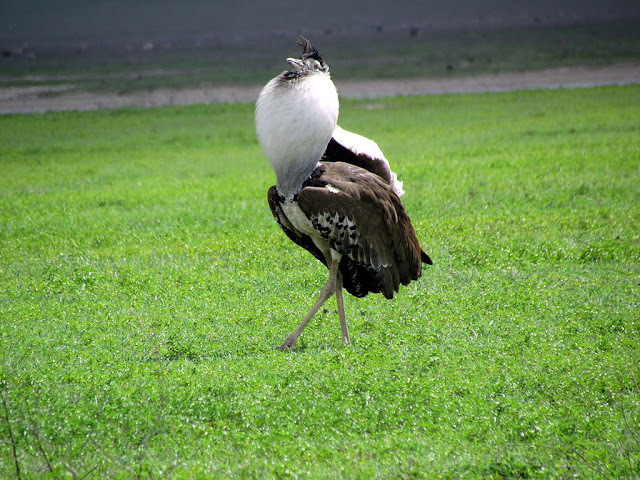 The male kori bustard is larger than female can reach up to 120 to 150 cm (3 ft 11 in to 4 ft 11 in) in height with wingspan about 230 to 275 cm (7 ft 7 in to 9 ft 0 in). Its weigh can reach up to 7 and 18 kg (15 and 40 lbs). Even though they were reports mentioned about the outsized specimens with weighing up to 23 kg (51 lb) and more. Africa has the most diversity of the bustard species and spread throughout the continent. Among them are Denham's bustard (Neotis denhamii) and Ludwig's bustard (Neotis luwigii). 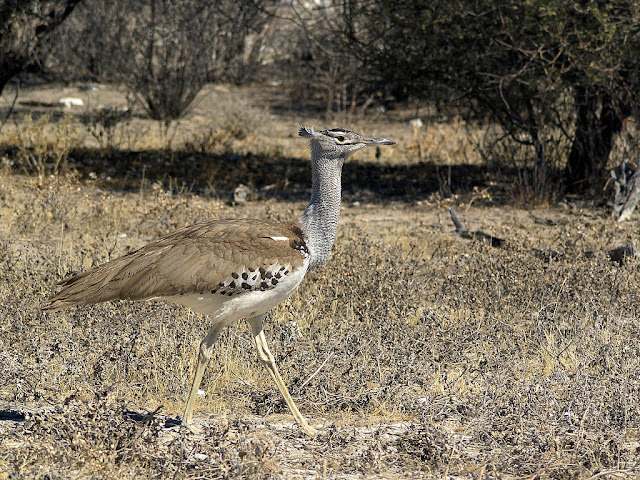 While, Arabian bustard (Ardeotis arabs) has its range on the East Africa. Same as many other birds, kori bustard has its own courtship displays to impress the females. The courtship display will followed by low-pitched booming noise with inflated neck where the male will look larger. Several males will be compete among each other. 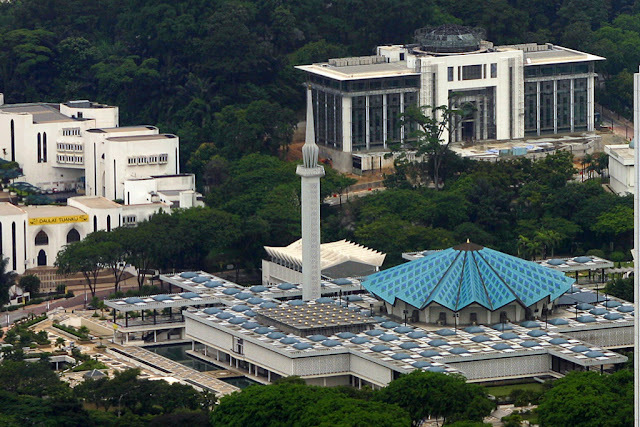 There will be fight between males with serious battle in order to win the females. One male will mates will several females in his territory – different from albatrosses and swan that will mate only with one female for long period of time. Only female kori bustard will look over their eggs. Usually 2 eggs are laid, and seldom 1 or 3. Female built their nest within the tree shrubs, termite mount or an outcrop of rocks. Their plumage colour and behaviour make their nest is hard to be spotted. Young chicks will grow up quickly and ready to follow their mother few hours after hatched. They fledge at 4 to 5 weeks old, but only ready to fly until 4 to 5 months. Usually one of the two young make it to adulthood. Living their mother in their second year, and ready to breed when they become fully matures around three to four years old. Kori bustard is listed Near Threatened by IUCN (2013). They are rarely since in human populated areas. 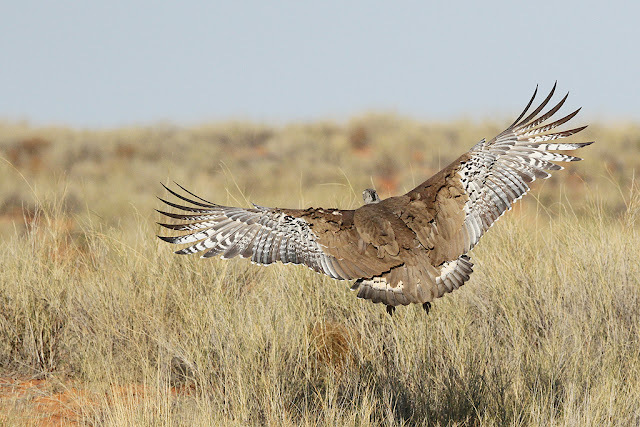 The development such as power lines can kill this bird (the powerlines in Karoo kill 22 kori bustard during 5 months period). More study should be conducted in order to help this bird from extinction.